So unfortunately I did that thing I always do where I don't write the review right after I read a book. And now it's 3 weeks later and I'm straining my brain to remember what I wanted to say about the book. Sorry I'm dumb. This was the second book I read by Yoshimoto (my first was Kitchen which I loveeeed) and I really enjoyed it. That's saying a lot for me too because I don't usually enjoy short stories. I'm not sure what exactly I can say that will properly imprint how the book left me feeling. Her writing is beautiful and exact. Short and to the point, and yet still capable of making me remind myself to breathe after a passage makes lose my breath. The stories in Lizard aren't exactly related to each other- rather they all are focused around the idea of hope. She gives us snap shots of someone despairing- either because a drab day or because of life in general - and then ends the story with a glimmer of hope that makes you smile. This whole book makes the attempt to show you that things will be okay. For example the first story shows us a man on the train who is disappointed with his life. He doesn't want to go home to his wife. He's considering just riding the train until the end of the line. Getting off there and starting all over. A random person sits down next to him and starts asking him about his wife and reminding him of the reasons he fell in love with her in the first place. This whole book is like that. There is nothing extraordinary happening. No big revelations. Just snap shots of people going on and making the most of what they have. Since I'm not sure if I am doing a good job explaining this book, I'll leave you with my favorite quote. When I read it, I flipped the page back and read it again. And then I called my best friend and read it to him. I probably would have read it to anyone walking past my porch at the time too. “Your love is different from mine. What I mean is, when you close your eyes, for that moment, the center of the universe comes to reside within you. And you become a small figure within that vastness, which spreads without limit behind you, and continues to expand at tremendous speed, to engulf all of my past, even before I was born, and every word I've ever written, and each view I've seen, and all the constellations, and the darkness of outer space that surrounds the small blue ball that is earth. Then, when you open your eyes, all that disappears. I anticipate the next time you are troubled and must close your eyes again. The way we think may be completely different, but you and I are an ancient, archetypal couple, the original man and woman. We are the model for Adam and Eve. For all couples in love, there comes a moment when a man gazes at a woman with the very same kind of realization. It is an infinite helix, the dance of two souls resonating, like the twist of DNA, like the vast universe. Haven't heard of it, but it sounds like it has a lot of promise! Great review - I'm definitely going to look into this series! 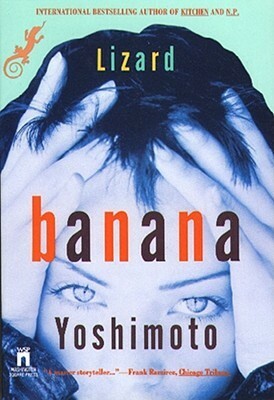 I've heard great things about Banana Yoshimoto but I never had the chance to read any of her works. The quote is so beautiful- short but to the point. After reading the quote, it definitely makes me want to read her works! If I find Lizard by Banana Yoshimoto, I will be sure to read it. Anyone who has such an interesting name must be a very interesting writer.